1. Do you watch the actual game or only watch for commercials and half time? 2. Which team did you want to make it to the Superbowl? 3. Which team will you root for? The Ravens or the 49ers? I will admit right now that I am not into sports. The closest I ever got to being a sports fan was when I followed the Dallas Mavericks (basketball) with my college friends only because they would have $1 drafts at all the bars around our school during the games. I can't just ignore the Superbowl, I'd be totally lost at the proverbial water-cooler the next day. But people are usually done talking about the game on the day of the game, what is left to discuss? The commercials! With Superbowl commercials being a thing themselves, it makes a great experience for the non-sports fans out there. When companies try to out-funny themselves from years past and their competitors, the American people win. But I can tell you that this is hysterical. I was pulling for the Texans just because they are my hometown, and my little brother is obsessed and will put a voodoo curse on you if you claim to support another team. But yeah, I don't care either way. This is tough because I try to find a link to the teams in one way or another. I like the Raven's colors the best, and how their team mascot is inspired by literature. I really liked that movie "The Blindside" with Sandra Bullock, and Michael Oher plays for the Ravens. I have been to Baltimore only because my plane landed there when I was going to DC. San Francisco I like because of the area's liberal leanings. My friend Lawrence lives there. I really liked the movie 'Milk" which took place in SanFran. I am also a fan of Rice-a-roni. I am probably going to just root for everyone who makes a point. I mean the game is all just filler between the commercials for me! share the button on your post, and be sure to link up with simply-linked! Next week's theme: Facebook is celebrating Doppelganger week February 3rd-9th. 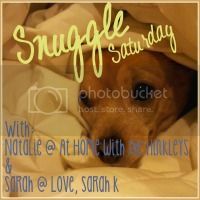 Hope to see you next week for SNUGGLE SATURDAY! Hahaha~ I remember that commercial! So hilarious!! :D Loved it!